Japan's early June trade results show a goods trade position having swung back to surplus in June from deficit in May. 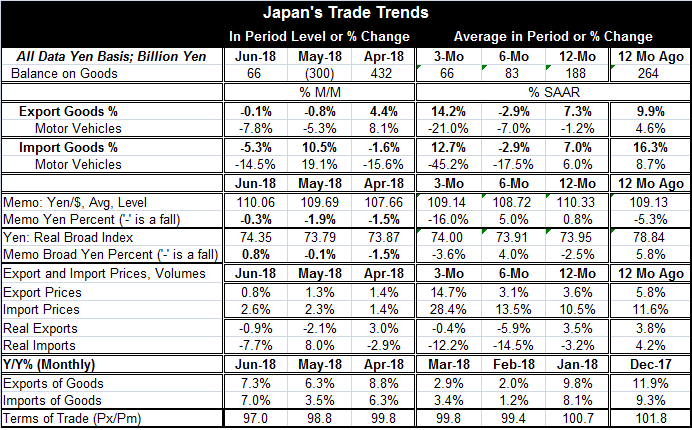 Japan's trade position has been alternating between surplus and deficit for several months after a seven-month run of logging steady surpluses. Separate export and import trends do not help to sort out this mess. Over 12 months, exports grow by 7.3% to imports 7% - nearly a dead heat. Over six months, both exports and imports fell at a 2.9% annualized rate. That's uncanny likeness. Over three months, there is a bit more ‘separation' but not much as exports grow at a 14.2% annualized pace compared to imports at a 12.7% annualized pace. Neither exports nor imports give a clear sense of trend from their growth rates of 12-month and less. The graph shows that export and import growth rates have fallen and become choppy at lower levels of growth. Yen exchange rate movements have been muted over the past year. Over the last 12 months, the yen has risen by 0.8% vs. the dollar while falling 2.5% against a broad trade-weighted basket of currencies. Exchange rate movements are not dominant in affecting either export or import flows or prices. Having said that, the trade volume data are a world apart from the nominal growth rates we just cited above. Export and import nominal growth rates are very similar on horizons of 12-month, six-month and three-month. But volumes are vastly different. Under the nominal skins, there are very different things going on for exports vs. imports. Export volumes are trendless but tend toward weakness. Export volumes (real exports) are up by 3.5% over 12 months, then fall at a 5.9% pace over six months, and then fall at a much slower, 0.4% pace over three months (SAAR). In contrast, import volumes are falling over 12 months by 3.2%, then step up that pace to fall at a 14.5% annualized rate over six months and then a slightly slower but still substantial -12.2% over three months. Export patterns go from expanding to contacting and flattening. Import trends go from contracting to plunging. Since the nominal flows are very similar, the difference in the volume behavior is essentially made up by price behavior. Weakening import volumes pair with strengthening price gains as import prices gain 10.5% over 12 months and then accelerate at a 28.4% annual rate over three months. Export prices step up from 3.6% over 12 months to 14.7% annualized over three months. Japan did log an unexpected negative Q1 growth rate, and in the wake of that, import growth is remaining very weak. Japan continues to fight for every inch of progress it can get. Inflation is still a nonstarter. And now between dropping Q1 GDP and weak import growth, domestic demand in Japan is looking like it is laying down a legacy of weakness. Japan is having these difficulties as China, its main trade partner, is slowing down and as the United States is ruffling feathers over trade policy. The impact of U.S. trade policy is not yet really evident in trade flows, but that will be an added risk in coming months. Japan looks like it is in for a bumpy ride.